Funerals are undoubtedly sad and emotional occasions, but they can also be uplifting and cathartic. 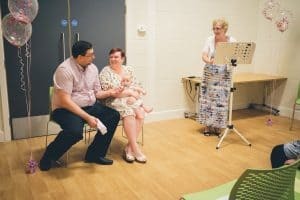 When I am asked to visit a bereaved family, I never know what amazing life story I might hear and, although the opening comment can be, “I don’t know what I can tell you”, after a short time, extraordinary and often inspirational details emerge and it is a privilege for me to talk about the person. 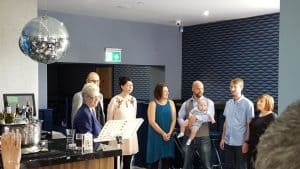 Sadly, I have also conducted several ceremonies for young adults, children and babies who have had less time to make their mark upon the wider world – but whose loss has such a profound impact upon the people who knew and loved them. As always, the emphasis is on acknowledging the importance of each of their lives and the lasting memories they leave behind. There is of course no religious content in the ceremony, so the time we have can be spent reflecting on the life and personality of the person we are there to remember. These are always joyous occasions – each one individually prepared to reflect the personality/requirements of the couple. 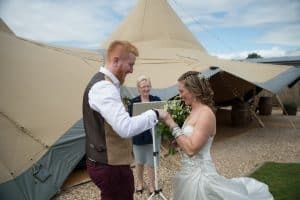 Whether in the formal surroundings of a country house or in the less formal setting of a family garden, the intimacy and poignancy of the promises they make to each other, along with carefully chosen music and readings, makes each one a memorable, dignified and truly personal celebration. 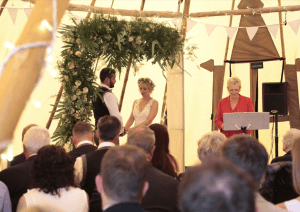 It should be noted that, despite an ongoing campaign by the BHA, a Humanist ceremony is a celebration of the marriage and has no legal standing. Most couples attend a Register Office prior to the ‘main event’. I usually conduct ceremonies within a radius of around 30 miles (50 miles for weddings) of my home in Woodthorpe, Nottingham. 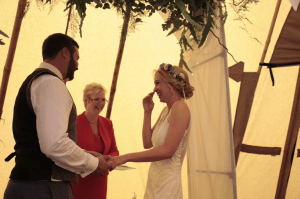 Freed from the restrictions imposed on the legal part of the proceedings, a wedding/civil partnership ceremony can take place anywhere the couple has the land owner’s permission to use. It can also be outside and at night or early in the morning (the legalities can only take place inside and between 8am and 6pm). 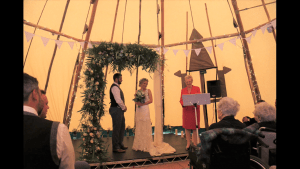 If planning an outdoor ceremony, it is advisable to consider a wet-weather option! Funerals take place in a crematorium, cemetery or green burial ground, but the ceremony which precedes or follows can be held elsewhere if appropriate. An example would be a graveside ceremony for the immediate family followed by a much larger gathering in a hall or hotel. Similar venues would be used for memorial ceremonies. 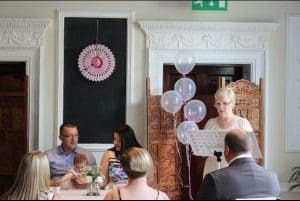 The venue for a naming is often the family home/garden, or a room hired in a village hall/pub/club – anywhere which is child-friendly and suitable for the number of guests invited.